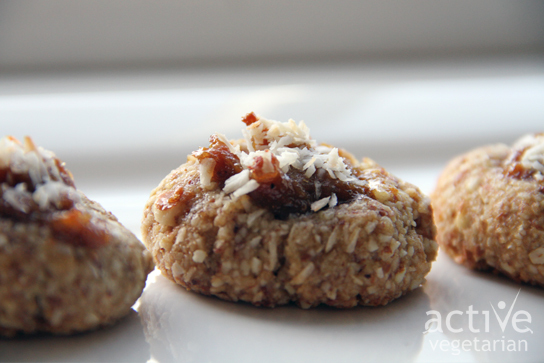 These cookies are super easy to make and only contain a short list of ingredients, but don’t be fooled they are packed with nutrients and are delicious! You might be surprised but figs are packed with calcium, potassium, iron and even omega-3 and omega-6 fatty acids, making them a great addition to any meal. They are especially beneficial for diabetics – because figs are rich in potassium, it helps to regulate blood sugar. Also another bonus – It is said that eating figs can relieve fatigue and boost brain power too. 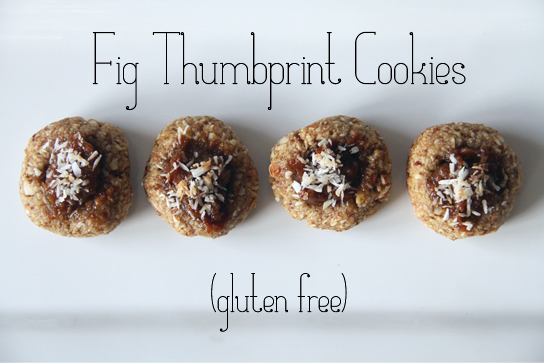 Now what better way to wake up and boost your brain power than eating Fig Thumbprint Cookies!? *for any nut flours simply grind raw nuts until flour texture is formed, using a food processor, blender or even magic bullet. Place the figs in either a food processor, blender or magic bullet. Add some hot water and combine until paste is formed. (you want it to be fairly thick). Scoop fig paste into the nest of each cookie base. Topped with shredded coconut. Bake for 10-12 minutes until bottoms are golden brown. Allow to cool and Enjoy! These look delicious. Two questions, can you use another flour other than walnut? Is the one tablespoon of vanilla correct?